Heading to a yoga retreat in Costa Rica frightened and excited me all at the same time. The intimidating part was that it had been over a year since I had practiced any yoga; my mat was getting dusty in the back of the closet and my downward dog looked more like a lazy cat stretching. 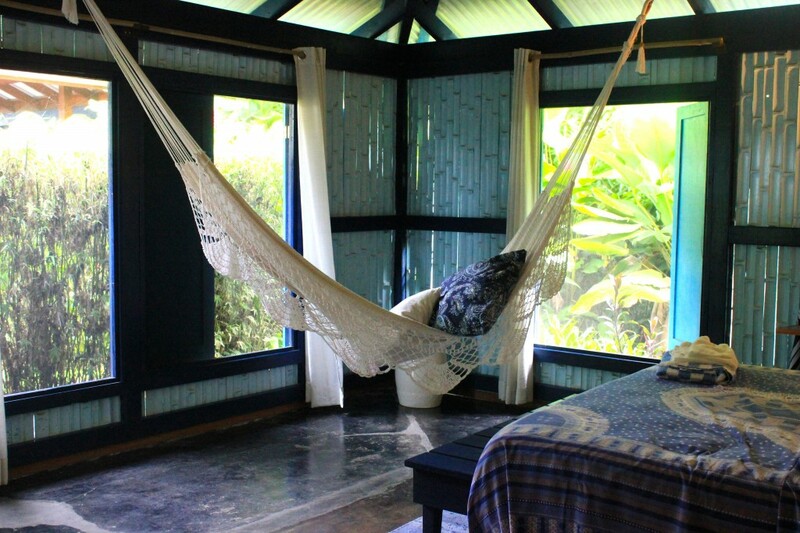 The thrilling part was that I would be spending a whole week at Blue Osa Yoga Retreat + Spa on Costa Rica’s Osa Peninsula, located on the countries southern Pacific coast. 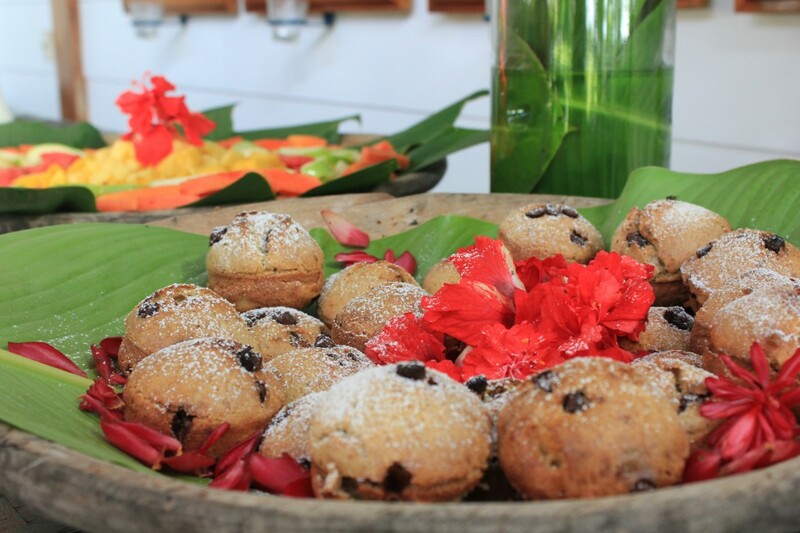 Blue Osa is known for practicing morning silence, exercising sustainable tourism, having a secluded beachfront property, healthy farm-to-table meals and as being a place to nourish the body, mind and spirit. Who couldn’t use a little nourishing? 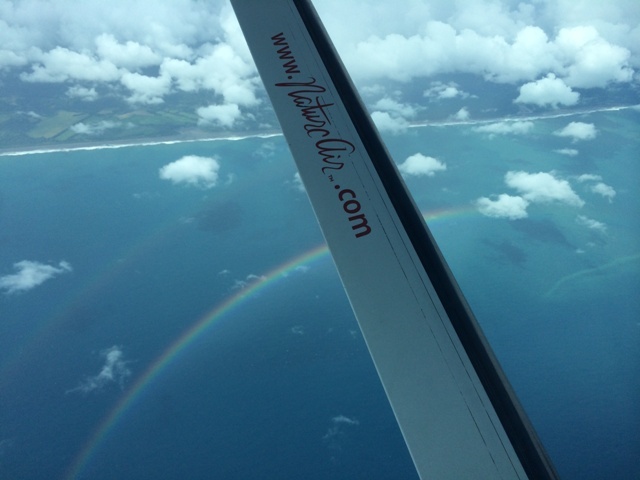 From Costa Rica’s main city of San Jose I boarded a teeny, tiny twelve-seater NatureAir plane heading to the Puerto Jimenez airport. Not being a fan of flying in general, the size of this prop plane made me uneasy, but it sounded much better than the eight hour drive it would have otherwise been. Though this theory was seriously questioned as the pilots navigated us through a storm where grey clouds engulfed the plane and rain pounded against the windows. 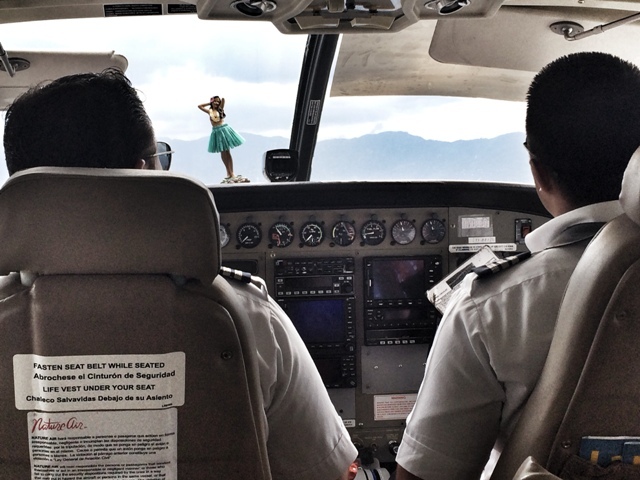 As I gripped on to my seat and the hula dancer on the dash swayed, the pilots calmly smiled putting us all more at ease. This was common territory and no cause for worry to them. A few minutes later we hit clearer, less bumpy skies. Phew. Shortly after, we realized the benefit to flying a small airline. When one of the passengers spotted whales down below the pilot stopped his current flight path and circled the water so everyone could get a glimpse. That wouldn’t happen on a United flight. Forty-five minutes later we landed at the airport or rather the Puerto Jimenez landing strip along the Osa Peninsula. I wanted to kiss the ground. The shuttle picked me up just a few feet from where the plane landed and we headed eight miles South of the town of Puerto Jimenez to Blue Osa Yoga Retreat + Spa. Located in a mostly vacant section of the Osa Peninsula, on a gravel road, I found my home for the next seven days. Walking through the wooden gate immediately brought a sense of serenity. It could have been the lush green foliage that laid before me or the sounds of waves crashing in the distance or simply the fact that I wasn’t on that miniature plane any longer. To the left was the garden, where herbs, fruits and vegetables were being grown for use in the kitchen. To the right a group of rooms with the open-air yoga studio on the second floor. 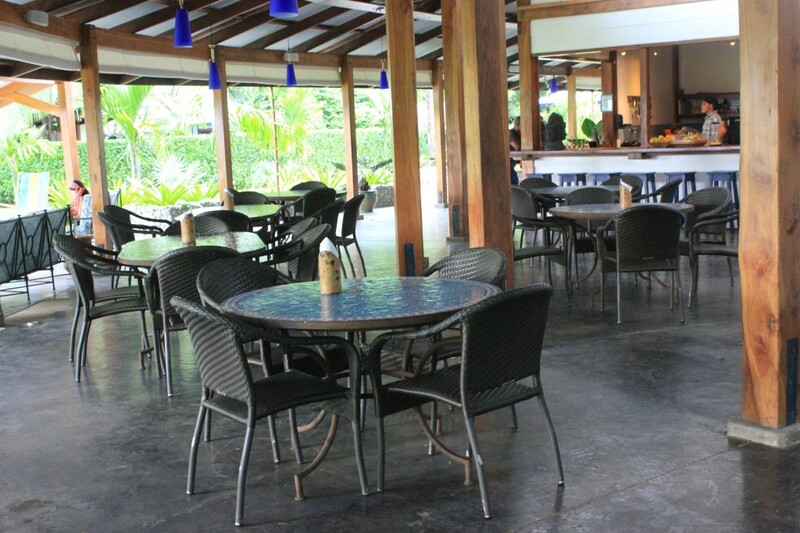 I walked further to the outdoor dining area surrounded by comfortable seating. 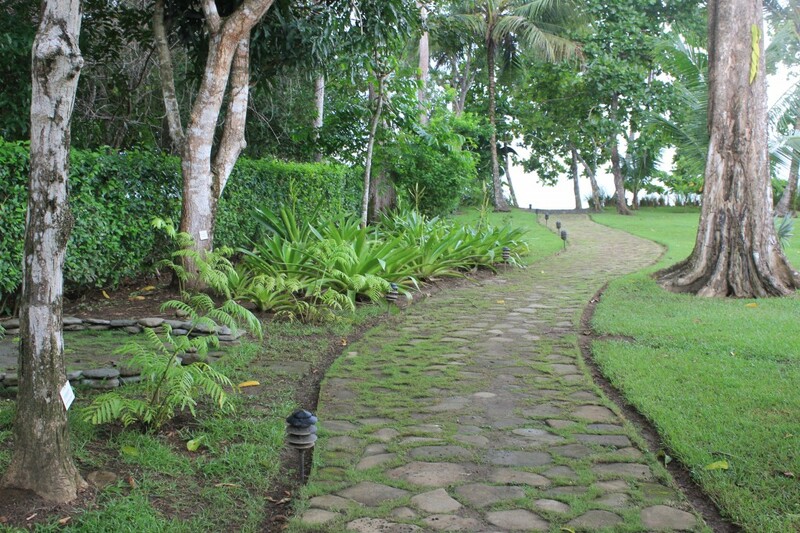 The pathway from here led to the secluded beach where I would be watching many sunsets. Looping around the property clockwise through the grass, I was greeted by the stunning royal blue lap pool which was next to the spa. My room was just steps away from here. How convenient. 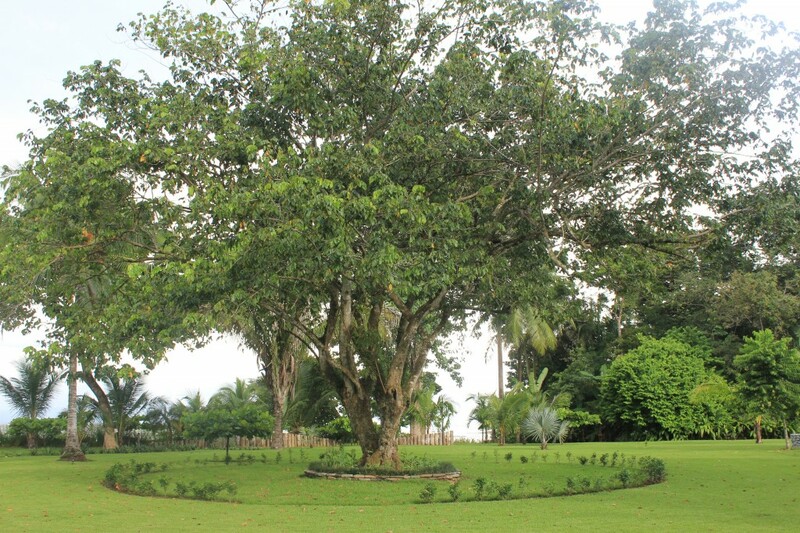 Besides the three resident dogs and one cat, the Blue Osa grounds was filled with wildlife: white-faced monkeys in the trees, ginormous spiders that seemed to be permanently planted on their webs, jumping toads and colorful macaws. Each morning I was woken up not by the typical rooster back home, but instead by howler monkeys in the trees and the seemingly millions of birds overhead. And each evening I would enter my room wondering what critter was going to be my roommate for the night. One evening it was a black centipede, another a light green lizard and on a particular fun night, the largest cricket-like bug wanted to share a bed. My room was true to the properties name, decked out in a dozen shades of blue. It was fully equipped with two beds, bathroom, shower and sink. Though, there were no hair dyers or flat irons allowed because the retreat is operated by solar power with minimal power usage. Truth be told, I was looking forward to not having to “do” my hair and spending the week without wearing a stitch of makeup. The monkeys weren’t going to mind. Besides the soothing color of the room, the hammock located at the entry was what immediately caught my eye. Who really needs a bed when there’s a hammock? I spent quite a few lazy hours in that hammock reading, writing, reflecting and even napping. But, when I was not lounging there I laid in my bed, covered by a mosquito net, that made me feel like I was a cozy child in my own little tent. The first night I laid in bed, not watching a rerun episode of ‘Friends’ (what would typically be happening at home), but instead gazing at the ceiling watching a firefly blinking overhead and listening to the raindrops on the roof until I fell asleep. Meals were served three times a day (plus snacks), buffet style with a farm to table, clean eating concept. Being a restaurant owner, chef and self-proclaimed travel foodie I am overly critical about food. But, this was some of the most delicious. Almost all the breakfasts included homemade baked goods like chocolate-orange muffins, fresh cut fruit and creative eggs (think ginger spiced scrambled or Shakshouka Israeli Eggs). The fruit that wasn’t eaten at breakfast was then sometimes turned into an naturally sweetened juice to quench your thirst throughout the day. Lunch and dinner were both equally as eclectic and delicious. The first nights meal had the most incredible coconut crusted red snapper, green mango salad, cauliflower gratin with coconut milk, black beans with Chinese five spice and a Coconut flan with roasted pineapple to top it all off. All the other afternoon and evening meals were just as good as the premiere. The one dish that was the most popular the entire week amongst the guests was the fried onion rings. After an hour and a half of yoga each day, adventurous tours and healthy eating, those got devoured within minutes. The cooking was done by Marie, who was raised in the South of France. She is a self-taught chef who is incredibly talented. She is currently writing a cookbook called Voila, one I’d definitely buy because she managed to make healthy food taste flavorful and be filling. If you are interested in her style try this Gluten Free Banana Bread Recipe. It’s not only gluten free, but wheat free, sugar free and delicious! Last, but definitely not least, I can’t forget to mention my favorite hour at Blue Osa: Cocktail hour. Each night they featured a different specialty drink like a Carambola Mojito, Caipirinha or a Hot Maracuya. You could watch as the bartender muddled fresh fruit, vegetables and herbs for each one. The morning after I arrived at Blue Osa, my first yoga class was scheduled and I arrived twenty minutes early in order to secure a place in the absolute back row. I did not want all the other attendees to see how much of my time would be spent on my knees, bent over in childs pose. The peaceful yoga room was located on the second floor of the property, which allowed for the sea and green foliage to poke through. The open shuttered windows made it feel as if we would be doing yoga completely outside. Why didn’t they have a hammock in here? The bell chimed, which was not only used to indicate meal time, but meant it was time to begin our yoga class. Our instructor was none other than Blue Osa owner, Yogi Aaron. He began, not only our first class but every class, with a twenty minute talk about yoga, life, peacefulness and everything in between. When it was time to do the actual yoga, the pace was at a level that pushed my limits, but was not so overwhelmingly hard that I wanted to curl up in the corner like a crying baby. Though, one important thing we learned was that practicing yoga is individualistic and about listening to what your body was telling you. Justification for practicing a lot of childs pose. In the afternoon of my third day at Blue Osa I was scheduled at the Spa for a facial. My second one ever in my life. Typically, the spa is not my within my comfort zone. I can count the times I have been to a spa one on one hand. But, in the professional hands of Laura, I closed my eyes and relaxed as she spread lotions and potions on my face. Towards the end, she paired the seven chakras with aromatherapy, ringing a bell after each one. This hour was a truly soothing experience, just like the yoga that morning, the practice of silence and entire Blue Osa experience. After my spa treatment I continued my relaxation in the bath water temperature lap pool. If I could get my evening cocktail served here it would have been a perfect day. 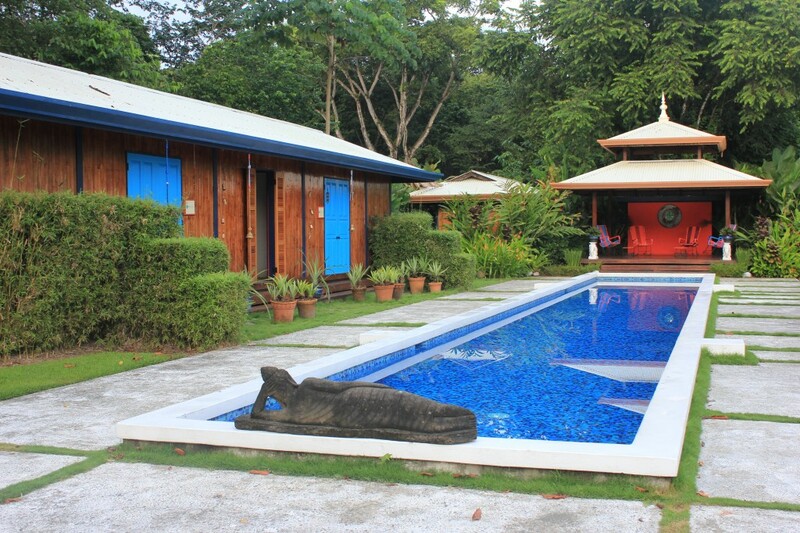 Though you may never want to leave the serenity of Blue Osa, they also offer bucket list worthy tours. While I was there, I did the 100 foot waterfall rappel, cacao farm tour, surfing class and even participated in a baby turtle release. 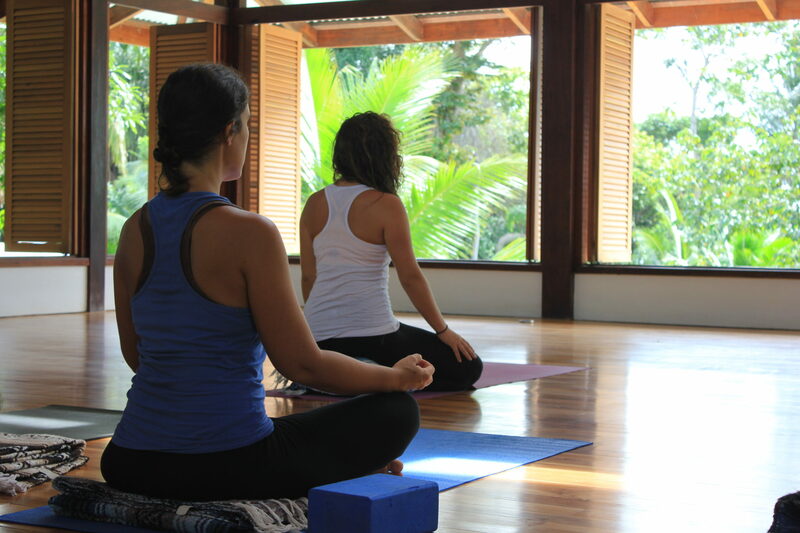 Yoga retreats in Costa Rica, including the Osa Peninsula, are generally weeklong, live-on-premise experiences. The hardest decision you will have to make is which retreat to go to, as each has different instructors and techniques. It’s best to look at the upcoming retreat calendars on their websites to determine what falls in line with the type of experience you want. My relaxing week was spent at Blue Osa (www.blueosa.com), which is known for practicing morning silence, exercising sustainable tourism, having a secluded beachfront property and healthy farm-to-table meals. Other good options in the peninsula are the Iguana Lodge (www.iguanalodge.com) or Ojo del Mar (www.ojodelmar.com). The Osa Peninsula is a remote location and has very limited transportation choices while there. Most retreats will provide shuttle service from the Puerto Jimenez airstrip to the lodging and excursion operators will offer pick-up/drop-off services (fees may apply). Between spending time at the retreat and the extra tours your time should be pretty well filled up. But, if you have an interest in exploring on your own it will require either renting a car, hiring a driver or catching a ride in one of the few taxis. You will be resting your head at your chosen retreat on most nights, but if you need a night in San Jose before catching your early flight home, try Adventure Inn (from $94) who includes an all-you-can-eat breakfast and a free shuttle to the SJO International airport. If you want to do a little exploring in the city, enjoy a night at the historic Grano del Oro (from $167) or Aranjuez Hotel (from $46), just a short walk from the city center. 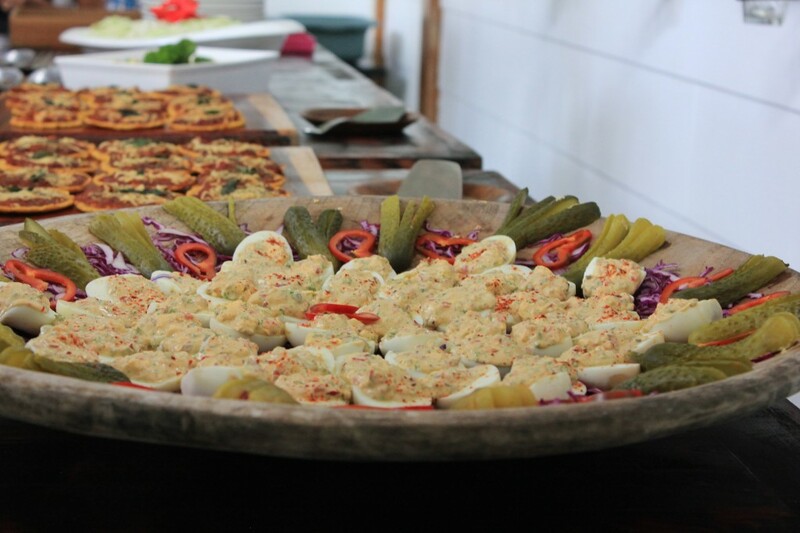 Another perk to nourishing at a yoga retreat is that most offer delicious and healthy food. 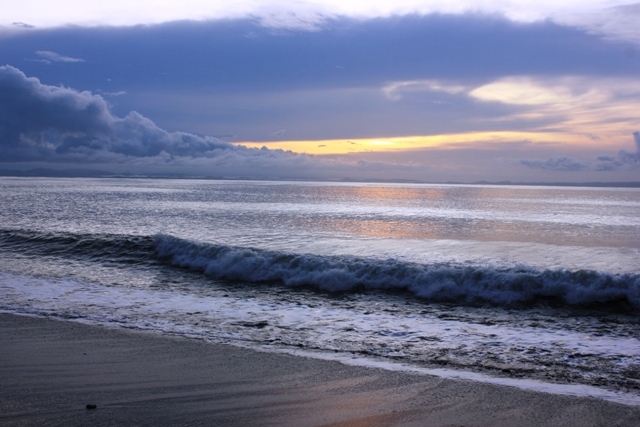 But, if you want to venture into the “big city” of the Osa Peninsula, head to the coastal town of Puerto Jimenez and indulge in the ceviche at the oceanfront Marisqueria Corcovado. Or opt for a taste of Italy with a thin-crust, wood-fired pie at PizzaMail.it (piazza central; 506 2735 5483). For a special treat head north to Drake’s Bay for a meal of fish tacos and tuna at Gringo Curt’s Seafood (Agujitas de Drake; 506 6198 5899). If you spend extra days in San Jose try Ram Luna (www.restauranteramluna.com) for Tierra Tica (Typical Night) where every Wednesday and Thursday evening you can not only eat traditional casado, but also listen to marimba music and see authentic Costa Rican folk dancing. 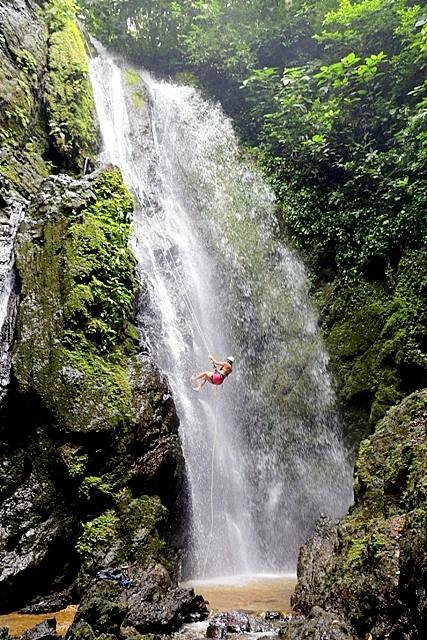 If you are an adrenaline junkie, go waterfall rappelling with Everday Adventures (psychotours.com). They will take you on a hike up a series of waterfalls, once at the top you will be instructed on how to tackle the rappel down two waterfalls (one 45 feet and the second 100ft). 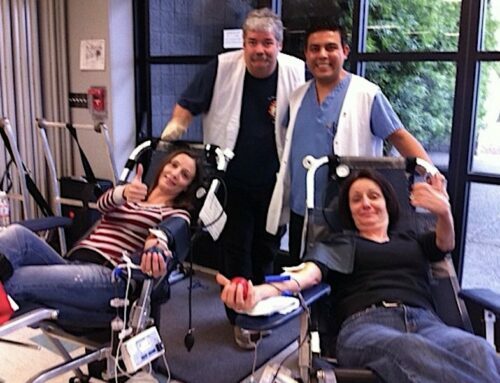 A heart pumping bucket list experience! They also offer a fun tree climb where you will scale up the trunk of a 200-foot strangler fig. The combo package for both adventures is $130, totally worth the 5-6 hours of adrenaline. Though most retreats will have yoga mats for rent and/or purchase, it’s always nice to bring your own. A small flashlight is helpful at the solar powered retreats where the walkways may be dimly lit. This will help find your way around while making sure that you do not step on any critters in your path. You can easily use your smartphone as a flashlight too, but don’t let bringing it out of hiding tempt you from the peacefulness of being disconnected with the real world. 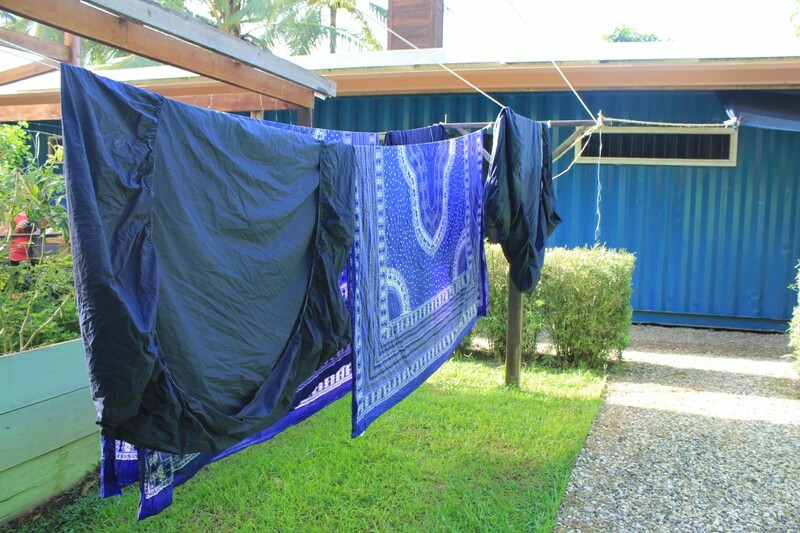 The Osa Peninsula’s tropical climate and casualness lends itself to simple, comfortable clothing. A mix of Yoga, lounge and beachwear works in most situations. So utterly exotic. I am in awe at the things you do. This is crazy. The overhead view of the whales. Sounds right up my alley. 🙂 The scenery, the food, the drinks, the bugs. 🙂 I know nothing whatsoever about yoga. I do love a good hammock though, I must admit. I am so envious about that turtle release. Sounds amazing. I can’t wait to see what adventures you have in store for yourself and to share with us here next. The turtle release was completely unexpected and incredible! It’s hard to believe how tiny they to be able to survive in the ocean. The Osa Peninsula is one of my dream spots. I didn’t visit during my last trip to Costa Rica in June thru July of 2013. You did such an awesome job of re-creating the experience for us. The wildlife is second to none on earth, as the Osa is regarded as the most biologically diverse spot on the planet. Being serenaded by Howler Monkeys and Scarlet Macaws sounds like a dream to me. We heard the Howlers on most days when we stayed in Quepos, they woke us but I had no problems because their call was so darn impressive, and cool….but the overall depth and variety of wildlife must have been stunning to soak up. We loved CR. We saw so many sloths in Manuel Antonio that it’d make your head spin. Did you see any Jesus Christ Lizards in Oso? Crazy to see them run across the water, like nothing I’d seen in person. I have been to Costa Rica twice and still have not seen a sloth! It’s the one animal that I actually spent time looking for. I suppose I’ll have to go to Manuel Antonio next time. Really enjoyed reading this – it made me feel relaxed without even going there! Sounded like a great trip. Sounds like a dream destination … hope you are enjoying yourself! Definitely one of my most relaxing destinations! I found your blog through google and I look forward to following your adventures, and read up on the previous ones! This yoga retreat was nice because they did a great job at teaching a class fit for many different levels. 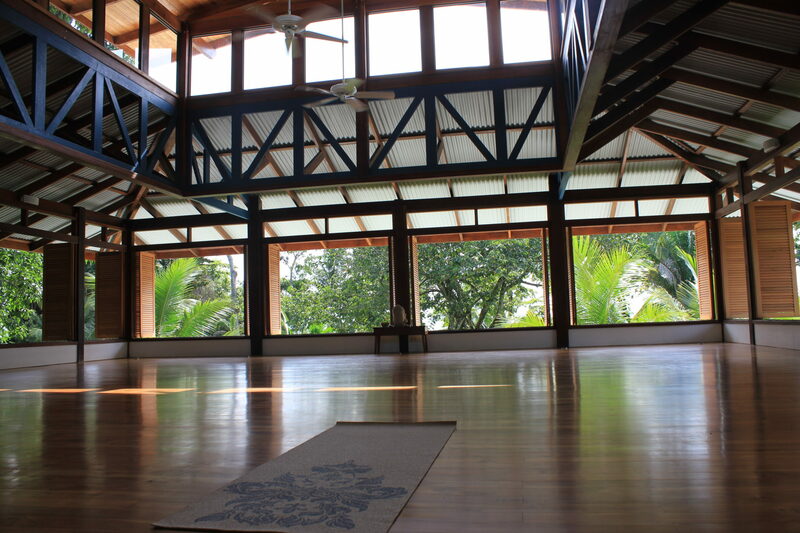 I love Costa Rica but never thought about a Yoga retreat there. My lady and I are planning to go back and surf, zip line (down a waterfall? yes! ), and now maybe hit up one of these! Costa Rica is so fabulous because you can do something completely adventurous and then the next minute be doing something completely relaxing! It’s weird, but in just a week I came home feeling stronger.